One of my favorite memories of summer is eating a big juicy, sugary bomb pop (always from our own freezer and not from the ice cream man, but that is another story for another time). And while I still like to indulge in a cavity provoking treat every now and again, I’ve put together a great alternative to the bomb pop. 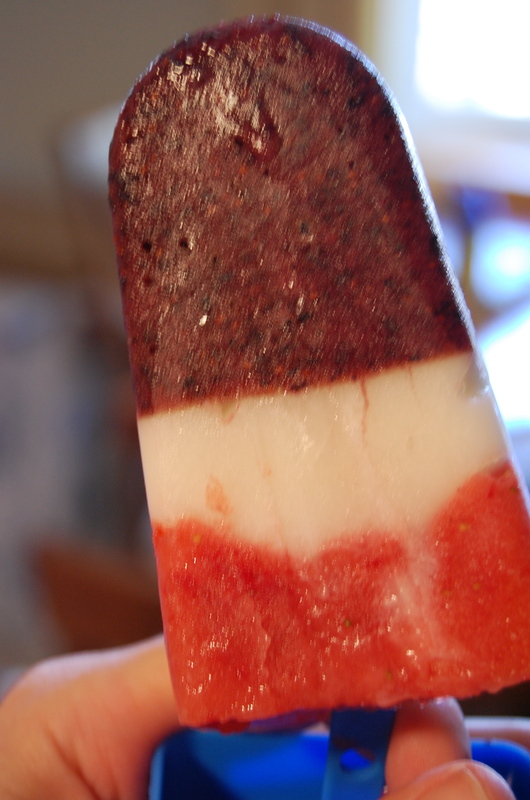 This is a great idea for a fun, Fourth of July BBQ treat! It is kid-friendly and adult-friendly and waistline-friendly as well. First you will need a popsicle mold (I bought mine at Target for $4). For the first layer, blend 1 C. blueberries and 1 tsp. of sugar or Splenda. Layer the mixture one-third of the way in each popsicle holder. Freeze for three or more hours. Add a layer of fat-free vanilla yogurt. Lastly, blend a 1 C. strawberries with a dash of orange juice and layer on the top. Insert popsicle holder and freeze for five or more hours. To remove popsicle holders, run warm water over the outside of the plastic containers to loosen up the popsicle. Pull it out and enjoy!